I have never been a fan of giving out loans to the government or any business if we don’t have to. So why in the world would I suggest paying extra on our utility bills? That doesn’t make much sense … am I right? Normally (about 99% of the time) I would never suggest overpaying for any type of bill … unless you are being charged interest or late fee’s. I have always worked hard at keeping as much of our money as possible and putting it to work for us earning more income. For example, years ago we decided to take ownership of our escrow account from our mortgage lender. At a minimum, that is over $40 worth of extra income each year. Recently however, I discovered that there are certain times when overpaying a bill may actually have some benefit. That benefit comes in the form of earning travel rewards and being able to hit your minimum spending requirements on a credit card to get your bonus. Note – I would like to admit that even though I don’t like overpaying for things … for years (and years) we would get back a huge federal tax return. That means we were overpaying our taxes and once a year would get a refund (usually over $5,000). I was always so worried about underpaying our taxes that I didn’t want to think about changing our W-2 withholding. Starting next year, we have made changes and will not be overpaying on our taxes anymore. For those who are new to The Money Sprout, I wanted to give a brief overview of how we are building a travel rewards portfolio. We are in the process of opening multiple credit cards that earn bonus points/miles for hitting a minimum spend requirement within a set amount of time (usually 3 months). We have a long term goal of taking a FREE trip to Hawaii and are optimizing our spending through travel rewards credit cards to make this happen. If you want to follow along on our progress, please check out our Travel Rewards page for the latest updates. The most recent card we are working on will earn us 80,000 points (worth at least $800+) if we spend $5,000 on the account over the first 3 months. We have been using this card to pay for gas for our vehicles, groceries, dance classes for my daughter, maintenance on our furnace, and much more. These are all one time expenses that we make throughout the month. 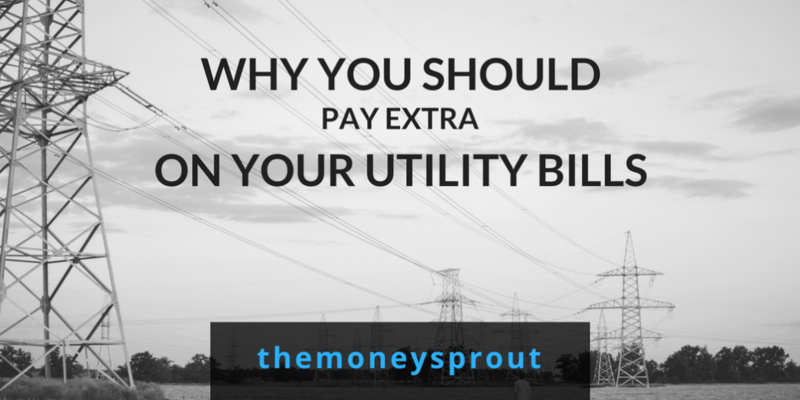 We also use recurring monthly expenses like utility bills to help hit our spending requirements. I am sure this list will vary for most people, depending on which companies you pay out your utility’s to. For example, we pay our water/sewer bill each month by credit card to the town we live in. They don’t charge any extra fee’s to pay by credit … so it makes sense to help earn credit card rewards against this expense. Here is a list of utility bills and other monthly recurring payments we are able to pay for with a credit card. It is important to point out that none of these payments have any extra fee’s for paying with a credit card. We also tried to change our monthly electric bill to pay by credit card, but they currently don’t offer that form of payment. I am sure there are electric/power companies out there that will let you pay by credit card. In addition to our electric bill, a few other monthly payments we cannot pay by credit card include: mortgage and car payments. By paying for our normal expenses (i.e. groceries, etc.) + recurring monthly expenses (i.e. cell phones) + one-time expenses (i.e. car insurance) … we will have earned 3 bonuses on different cards in the first 5 months of building our travel rewards portfolio. These bonuses will generate over 200,000 points (closer to 203,000) which is worth at a minimum $2,000! Once our 3rd card is finished, we plan to open a 4th card in my wife’s name that will earn us an 80,000 point bonus for spending $5,000 in the first 3 months. Based on the timing of this upcoming card and the higher spending limit … it will be more difficult to hit our minimum spending requirements. So it will take a little more planning and strategy to make this work since we won’t have as many one time large payments to use. This is where we may decide to use a new strategy of paying extra on our utility bills. I will say it again … “I am not a big fan of paying extra on most bills … including our taxes”. But that is likely what we will do early next year when we may decide to overpay on two of our utility bills – water/sewer and gas. Instead of buying up gift cards to Amazon or somewhere else to manufacture some spending … we will likely overpay our water/sewer bill first to manufacture some spending. Then if need be we may try to overpay our monthly gas bill. I actually tested this theory out this month by paying an extra $6 on our water/sewer bill. I wanted to confirm that we could first overpay on the bill and second get the credit applied in our account on a future bill … which worked. Our credit card didn’t know anything different other than the total payment … which was counted towards the $5,000 worth of spending we are currently working on for card #3. So even though I would normally shutter at the thought of prepaying our water bill for 6 months (or more) in advance … it is an option if we get in a pinch on our next card. I prefer this option over buying up gift cards for one big reason. We are not moving from our home anytime soon and will always pay $50 to $60 a month for water/sewer. This is a known expense … no matter what. Buying up gift cards on the other hand is not a known expense. Sure, we often make a lot of purchases on Amazon throughout the year. But sometimes we go months without. Next up – My middle son will be getting braces next year. Our dental insurance does not cover braces, so we are paying out of pocket. The orthodontist offers a interest free payment plan for 3 years … which is great. They also offer a one-time payment fee with a 5% to 10% discount … depending on a few different options. We plan to give ourselves an interest free loan from our emergency fund, get the prepay discount, use this one-time payment of $3,000+ towards another credit card, and pay ourselves back! More to come on this strategy at the first of the year. Do you prepay/overpay for expenses to hit your monthly spending requirements? I would love to hear your strategies for spending on travel rewards cards.